The Private Residences features unique homes with ultra luxurious finishings, spacious floorplans, gourmet kitchens, spa-style bathrooms and amazing views of downtown Vancouver. A beautiful skyscraper with 47 levels with only 156 suites is adjoined to the recently restored Hotel Georgia. The restoration of the Rosewood Hotel Georgia is a significant part of Vancouver's history; this boutique hotel is glamorous yet intimate. Hotel Georgia was first opened in 1927 and was a favourite amongst Frank Sinatra, Elvis Presley, Nat 'King' Cole and Bing Crosby, Living a colourful life in the city is easy. 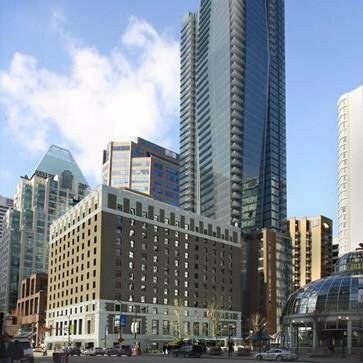 Walk to the financial center, corporate offices, leading lawfirms, Vancouver Art Gallery and Terminal City Club. There's no shortage of fine shopping on Alberni Street, fine dining and marinas nearby. What a privilege to live in a legacy landmark in central downtown Vancouver. Restaurants and Cafe nearby: Bel Cafe, Hawksworth Restaurant, Prohibition Bar, La Pavillion, Yew Seafood + Bar, Diva at the Met, Hy's Steakhouse, Faubourg, Cafe Artigiano, Vancouver Art Gallery Cafe. Developer: Delta Land Development Ltd (They have developed and built a portfolio of residential and commercial properties worldwide). Whether you want energy and excitement from the array of fine restaurants and lounges or peace and quiet in the heart of the city - Hotel Georgia Residences is for you. Legendary piece of history combined with a beautiful new skyscraper creates an outstanding centrally located landmark. An outstanding and award winning team of talented architects, designers and development team helped the developer restore this legendary beauty back to Vancouver. Listings Provided By: Sutton Group-West Coast Realty, Delta Realty Services Ltd., Engel & Volkers Vancouver, Oak West Realty Ltd., RE/MAX Crest Realty, Interlink Realty, Royal Pacific Realty (Kingsway) Ltd..